DENVER, CO--(Marketwired - Jul 16, 2014) - MusclePharm Corporation (OTCQB: MSLP), a scientifically driven, performance-lifestyle sports nutrition company, today announced that MusclePharm brand ambassador Tiger Woods will make his first major championship start of the year at this week's Open Championship, which will air on ESPN. To capture the return of one of golf's most iconic players, the network has announced a Woods dedicated feed that will follow his entire round each day he plays. In addition to all his shots, viewers will see everything from the walk between holes to Woods selecting clubs from his MusclePharm branded bag. The feed will air on ESPN3, the network's multi-screen online sports platform. Fans can enter a contest for a chance to win a Tiger Woods signed MusclePharm golf bag by taking a picture of Tiger and his bag on the television or online broadcast and posting it to Twitter, Instagram or Facebook with the hashtag #MPTigerBag. "This exclusive ESPN3 coverage exemplifies the interest people have in Tiger and the excitement that he creates. Not only is he dedicated to peak physical performance, but he's one of the all-time best players in golf," said Brad Pyatt, chairman and CEO of MusclePharm. Last year's Open Championship saw a viewership that ranged from 1.4 - 4.4 million people across the four days of the tournament, with similar numbers expected given Woods' participation this year. 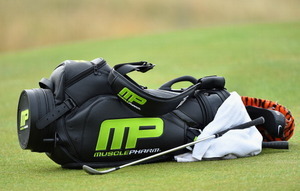 With its prominent neon green MP logo on Woods' bag, MusclePharm will be seen throughout the US and around the world. MusclePharm signed a multi-year endorsement deal with Tiger Woods last month that includes sponsorship of his bag, as well as additional marketing commitments and brand promotions. MusclePharm® is a scientifically driven, performance-lifestyle company that currently develops, manufactures, markets and distributes branded nutritional supplements. The company offers a complete range of powders, capsules, tablets and gels. Its portfolio of recognized brands, including MusclePharm® Hybrid and Core Series, Arnold Schwarzenegger Series™ and FitMiss®, are marketed and sold in more than 110 countries and available in over 35,000 retail outlets globally. These clinically-proven and scientific nutritional supplements are developed through a six-stage research process utilizing the expertise of leading nutritional scientists, doctors and universities. MusclePharm is the innovator of the sports nutrition industry. For more information, visit www.musclepharm.com.